Sherman Helmsley (a.k.a. George Jefferson) died over the summer. He starred in “The Jeffersons,” one of the spinoffs from Norman Lear‘s great 1970s sitcom “All In The Family,” the story of Queens family lead by a bigoted World War II veteran named Archie Bunker. Although AITF could devolve into annoying ham-fisted liberal moralizing (and why was everyone yelling? ), the comedic writing and acting were often brilliant. Intuitively, we understood that the story being told at 185 East 85th Street was our own. Movin’ on up meant moving away, an agony recapitulated each week during the show’s opening credits, by the image of Louise wiping away her tears, the close-up of George gripping his wife’s hand. … Making it in America, making it in terms of the American dream, was compromised for George and Louise by their loss, and it was here that The Jeffersons showed us where the American and immigrant experiences converged. Because of who they were, and where they came from, the Jeffersons could never feel like they fully belonged in tony Upper East Side, or what my father liked to refer to as “Grey Poupon” society. The past pulled on them, and although neither ever forgot where they came from, the longer George and Louise stayed away from the old neighborhood the less they knew of their old selves. 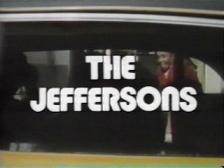 … Still, for all that The Jeffersons taught us about what American was and could be, there was also something very Persian and accessible about the show, not least of which was the acid back-and-forth between George and Florence (George: “Florence, your cooking tastes like dogfood.” Florence: “That’s because I’m cooking for a chihuahua.”), an American version of the Iranian custom of matalak goftan, or trash-talking. … It was easy to mistake George’s hustle as symptoms of a gratuitous and crass materialism, but in reality his endless striving, the relentless quest to impress the Wittendales of the world or to get into a posh tennis club, even though he had no clue or interest in the sport, was always about survival. Money, in George’s mind, represented the best defense against discrimination. “Let me tell you something about people,” George tells his old adversary Archie Bunker at a cocktail party. “That bartender’s willing to work for me because if you got enough green in your pocket, then black becomes his favorite color.” The reputation for flash and superficiality that clings to parts of the Iranian-American community, I think, originates from a similar social anxiety and defensiveness. George Jefferson was indeed a master of matalak goftan. One wishes Helmsley could have read this essay.